Caffélatex Strip gets wider to fit Plus and Fat rims. It's still a very light, puncture-proof and transparent tubeless rim strip that allows easy tubeless conversion of most Plus and Fat mountain bike wheels, using Tubeless or Tubeless-Ready tyres and Caffélatex sealant. Caffélatex Strip Plus and Fat is available in all the needed sizes, to cover all the Plus and Fat wheels in the market. * Part#: EM054 - Strip Plus S 26″/27,5″ (x2) NEW! * Part#: EM055 - Strip Plus S 29″ (x2) NEW! * Part#: EM056 - Strip Plus M 26″/27,5″ (x2) NEW! * Part#: EM057 - Strip Plus M 29″ (x2) NEW! * Part#: EM058 - Strip Plus L 26″/27,5″ (x2) NEW! *Part#: EM059 - Strip Plus L 29″ (x2) NEW! Using sealants containing aggressive chemicals or ammonia, or cleaning the rim with aggressive chemical products can damage Caffélatex Strip and may represent dangers to the user. We recommend using only Caffélatex sealant or Espresso inflate & repair cartridge with Caffélatex Strip. 2. Secure the Strip to the rim, tightening the nut on the valve stem. It’s important to push the valve base against the rim while doing so, to achieve a better air-tightness. I’m having troubles mounting the Strip Fat on my wheel… is there anything wrong with the product? – once the Strip is in the rim channel, just use a long screwdriver to correctly position it, as in the video. 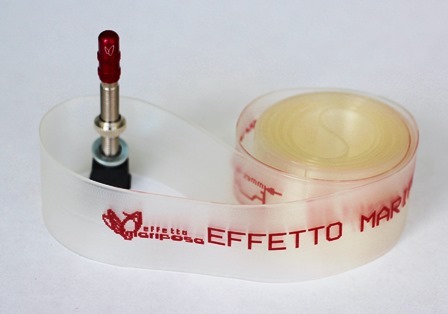 For most applications adhesive tubeless tape is great, and it will always be lighter than a tubeless rim strip. The idea is to create air tightness between the tire and the Strip, especially useful for pinned rims: in those rims the junction is not welded, and sealing the spoke holes in the rim channel is not enough as sealant/air can seep through the rim walls at the junction. As the Strip is born to be the ‘no problem’ tubeless converter, we have to cover also those rim types. My rim has a Schrader valve hole (diam. 8,5 mm). Should I use a valve adapter? The Strip will easily convert any Schrader-drilled rim, no need for any adapter (just use the provided tubeless valve and insert it in the Strip before mounting the Strip on the rim, as described above).